The following was posted earlier today on the Sampradaya Sun. 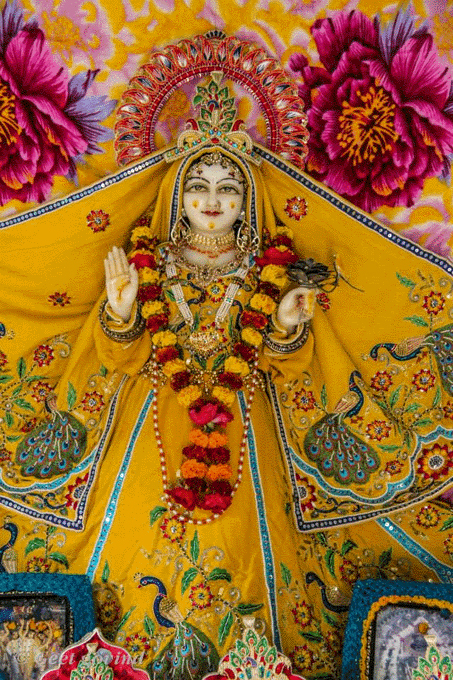 As a service to our readers and all vaisnava devotees of the lord, we repost it here. Next month will be 11 years since the opening of our Vrinda Kunda Temple! To celebrate, we will do special parikramas to the Holy Places of Braja. The program will culminate with our famous Kalash Yatra, an ecstatic Sankirtan procession with the ladies carrying water pots with coconuts on their heads. Programs will be going on from 14-27 Feb. The Vrindavan Festival after Gaura Purnima is usually quite hot so better to come to Vrindavan before! One year, a devotee told me that he never knew there was so nice weather in Vrindavan. So come to Vrindavan first, and then go on to Mayapur Festival and leave after Gaura Purnima when it starts to get hot! And our festival ends with plenty of time to reach for Mayapur Festival! We will depart almost every morning from Krishna Balaram Mandir by bus and go on parikrama to different pastime places of Braja. There will be lively narrations of the different pastimes that happened in each place. Then we will return in time for lunch prasadam in the temple. And on all bus parikramas, Sannyasis and Prabhupada Disciples and their families will go free of charge. Then on Sunday 23rd Feb., we will be having the super ecstatic Kalash Yatra and sankirtan procession around Nandagrama. Kalash means water pot. All the ladies will carry water pots with water from the sacred Pavana Sarovara with colorful cloth and coconuts on top. We’ll have 108 pots and the Brijbasi ladies will train our foreign lady devotees how to carry them. Even some of our own ladies who go every year will train them! The Brijbasinis even dance with no hands with their pots on their heads! All the ladies who have participated told me it was the highlight of their Vrindavan experience. That day is free for everyone! After reaching at Vrinda Kunda, there will be Krishna Katha, butter churning festival, artika and then feast for one and all. Then everyone can help feed all the Nandagram Brijbasis. That day all transportation and prasad will be free for all who come. So please come relish wonderful Vaisnava association in the Holy Dhama! Especially for those coming for Noida Temple Opening, our parikramas start after that. Or for those who are going to the Anniversary Festivals at Tirupati, Ujjain, and Aravade on Nityananda Trayodasi and are wondering what to do till Mayapur Festival starts, our parikramas will take place after Nityananda Trayodasi. For your travel needs as well as assistance for booking accommodation in outside guesthouses you can contact Krishna Balarama das at our Information Center at Krishna.balaram.jps@pamho.net. His phone no. is +91 9897476111. He can also arrange a taxi to pick you up from the airport or train station. For booking in the Krishna Balaram Guesthouse, you can contact ganapati.gkg@pamho.net or +91 565 2540021. For MVT, MVT@pamho.net or +91 565 3207578.